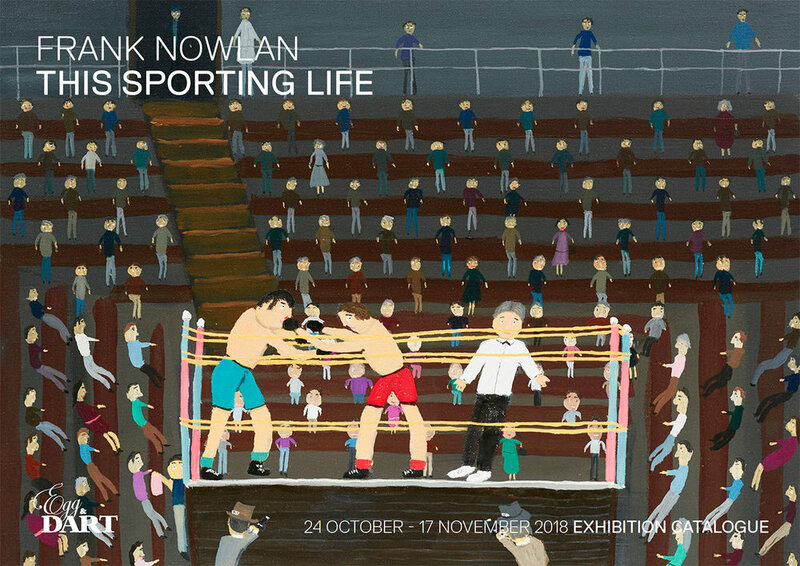 Frank Nowlan’s latest suite of paintings takes a broad look at the subject of sport. This is significant. In 1964, injured while playing rugby league, Nowlan began privately painting images of football. He was then encouraged to continue painting by an art teacher and kept this secret from his team mates. He later set painting aside to pursue history teaching. Having retired from that vocation, Nowlan’s current approach to sport is wilfully diverse. He chooses subjects of interest and sets up painting challenges – how to capture the mass of a crowd looking over a velodrome or how to alter perspective to reveal more of the ground where the action takes place. Then the paintings start to populate: Bradman as the backyard cricketer, a boxer known as The Torpedo. Australia’s first rugby side. The crowd is also a character, a mass of repeated gestural marks circuiting whatever ring or field the play is taking place in. Some works are in response to historical prompts – an early photograph of Tolstoy playing tennis or a story of monkeys riding atop greyhounds in the 1930s. Other figures are anonymous and everyday, players in a local game or two women playing football. The overall Nowlan style is evident across the current collection but it is an added pleasure to see him exploring repetition and variation within a specific arena. This thematic play between figures and the sporting ground allows for Nowlan’s distinctive painting style to assert itself in new ways. Frank Nowlan is a past winner of the Fishers Ghost Contemporary Art Award. His work is held in significant private collections as well as the Wollongong University Collection and the Wollongong City Gallery. His work was recently included in Australasian Painters 2007 –2017, an Artist Profile magazine survey show at Orange Regional Gallery. Along with previous touring shows from Hawkesbury Regional Gallery and Wollongong City Gallery, this places his work within a comprehensive overview of contemporary painting in Australia. Come join us for opening night Friday 26th October, 6-8pm.